Hello! Welcome to the first day of Taylored Expressions April Release Day! We are releasing 10 new stamp sets and 8 new dies! All products are available in the store now! 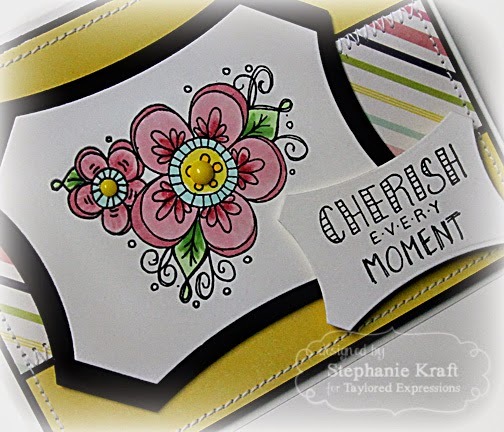 Today I have a card using Cherish Every Moment, one of two new A La Carte stamps illustrated by Danielle Lounds, who is no stranger to TE! She is a Baker's Dozen alum and now she's back as a TE illustrator! I absolutely love her doodles! Accessories: Taylored Dies: Label Stacklets 8 (TE), Markers (Copic), Jellies (Queen & Co), Foam tape, Thread, Sewing machine. Such a fab card! I love how you used the doodles and the colors are so springy! 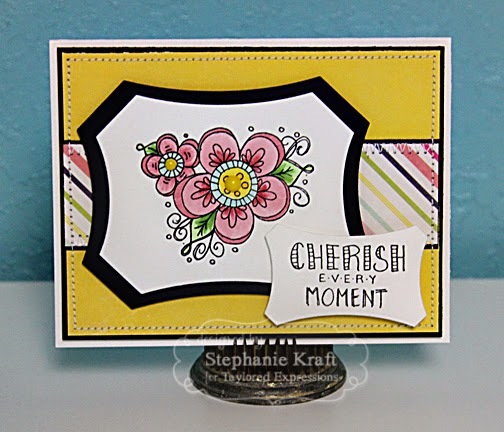 Such a pretty card Stephanie! Love the doodled flower!